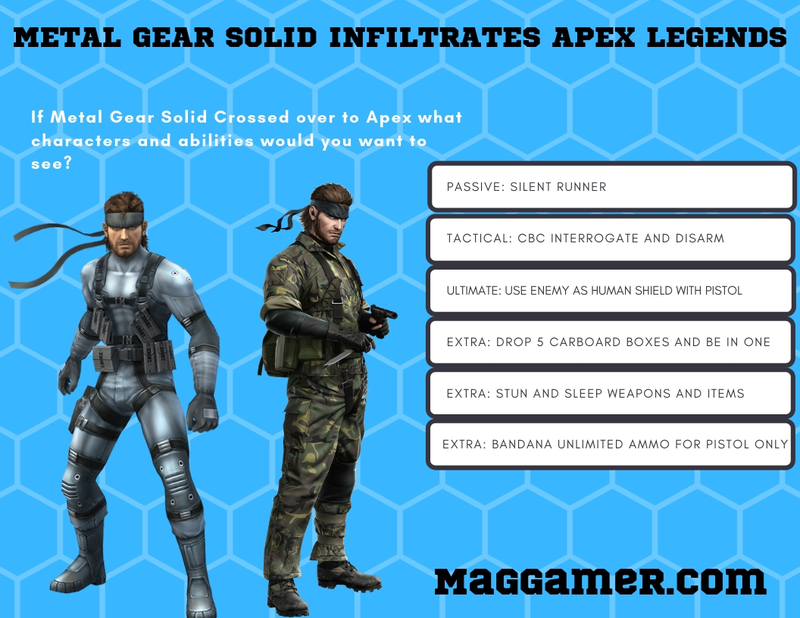 Disclaimer : This article is meant to spark ideas and start discussions about Apex Legends and Metal gear Solid. There is no confirmation or even speculation these ideas will come to life just fun to explore concepts like this. Feel free to add more fun ways to enjoy the games we love. Thank you for coming by. We start this off acknowledging the talented staff at Respawn Entertainment who showcased to me there are top tier developers with the 2016 release of Titanfall 2. 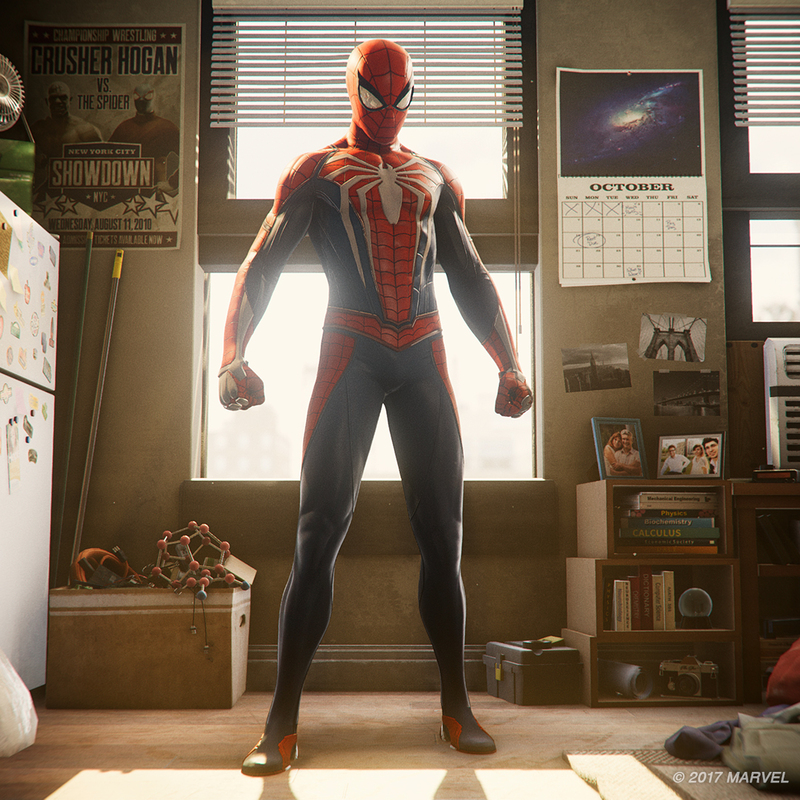 The game was masterful with some amazing gameplay innovations and an extraordinary put together overall experience. This new game being so well put together was no surprise if you been paying attention to how much work was done to offer a amazing product like TitanFall 2. 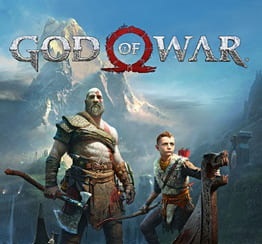 Lucky enough if you curious about it the game is on sale and ready to be enjoyed from its story to its multi-player, Thank me later. 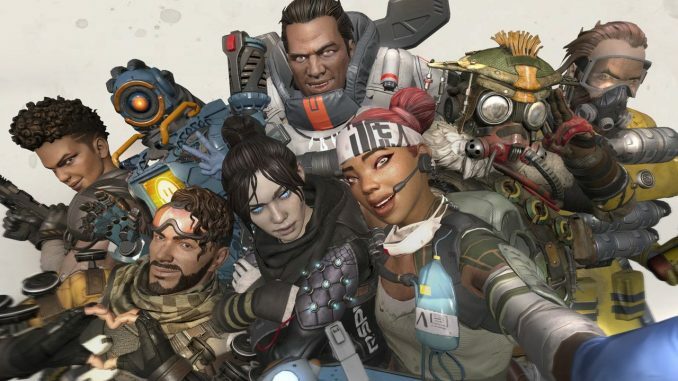 On to the Meat of the article Apex Legends free to Play Battle Royale which released February 4th 2019. There is tons that make this game special but it starts with the foundation of Titanfall universe. The speed and agile play make it for a high pace and skill than most BR genre games out now. 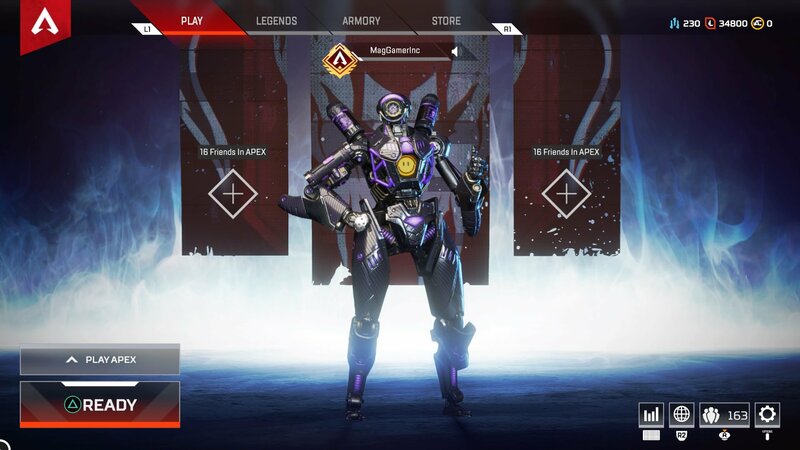 What stands out most are the Classes better known as Legends of Apex. Unique Characters with special abilities that make them stand out and add depth to the gameplay strategies. It gets interesting to see so many people combine the legends in different ways that make it even more of a strategic Br that no other has come close to these experiences. It is to me hands down the best Battle Royale game mode that has ever been made. How do I know? It’s a Opinion but the evidence is there. 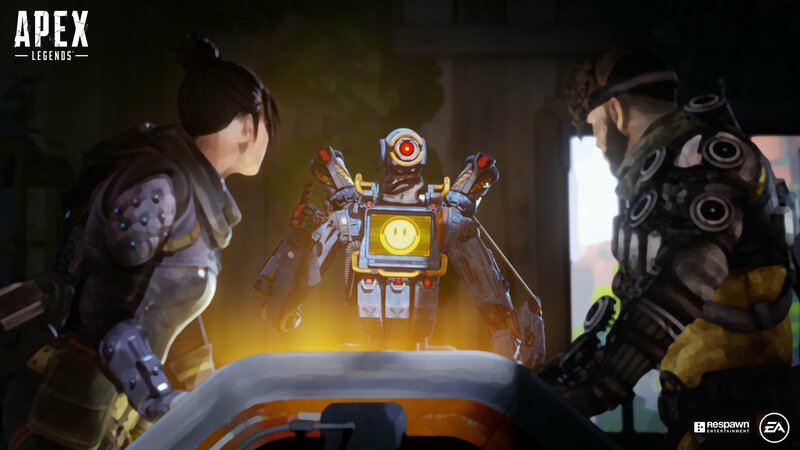 Not going to compare in this article but let’s be honest with ourselves there is few who can compete with the competitive and overall experience Apex Legends offers. As seen in the Picture Above this paragraph I have reached Max level and fully experienced this game as I done with most BR games that were worth the time to enjoy. On top of reaching level 100 I also have played each legend and got over one hundred kills with each which allows me to know and feel the gameplay differences and how it changes and adds to the experience. I did things like Play with pro Players, family and friends plus the dreaded jump in with random people tons of times and win many games showing me that it is humanly possible to enjoy this game on every level. I have war stories to share with friends who play it. Only certain games can give you this anything can happen with unpredictable plays that open new possibilities for strategies this si what stands out most about this game. All this said the article isn’t a praise the game thread so let’s slow down a bit and talk about what I would like to see from Apex Legends in the future. Cross overs from other titles coming to Apex Legends feels so right. Story wise if you played TitanFall 2 you know anything can be possible as far as time goes so why not add legends from other games like Nintendo does with Smash bros? I’m not asking I am telling you, yes the Respawn Developer reading this YOU!!! If you or anyone reads this send this out to the right licensing people. Sure it can be a headache with lawyers and negotiations but the fans and the Game will thrive big time. I am sure whoever reads this has already blown their own heads up thinking of their favorite legends in the game and that’s the point. Inspire everyone to get the word out but its also so I can get my ideas off also. Metal Gear Solid series can be a huge benefit to Apex Legends. Today I explore possible legends and their abilities. As we know Solid Snake and Big Boss are the most featured but what about Raiden? Ocelot? Gray Fox? With some fun discussion we can have our very own Battle Royale for Metal Gear Solid series. The Article is to inspire both companies separately and as a unit. Say what you will with internet memes but Both Konami and EA pump out quality games each year and I enjoy them. 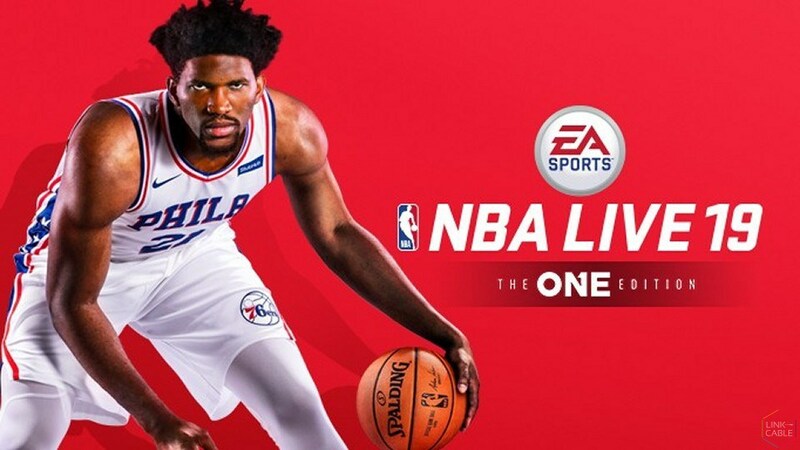 Everyone knows Metal Gear is my favorite series of all time and NBA LIVE series has held me since day one of its release but both Publishers have continued to create masterpieces and some fun games. 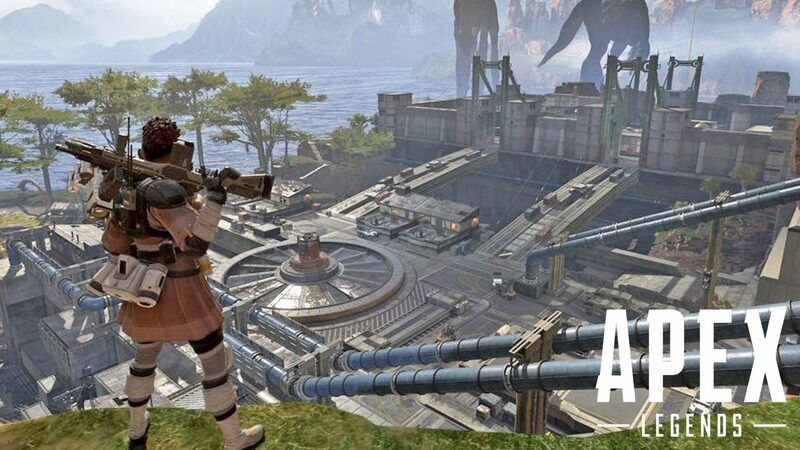 Hints Apex Legends which has no official story mode and is a Free to Play but a great time. My hopes is that Apex can take off the right way with things like crossovers,ranked mode and even a story mode that can add to the lore of the legends. Think about all this and spread the word lets hype Crossovers and more as I personally enjoy apex like I havent for any Battle Royale game. Just a heads up I maxed leveled on console but trust and Believe I am coming to PC. 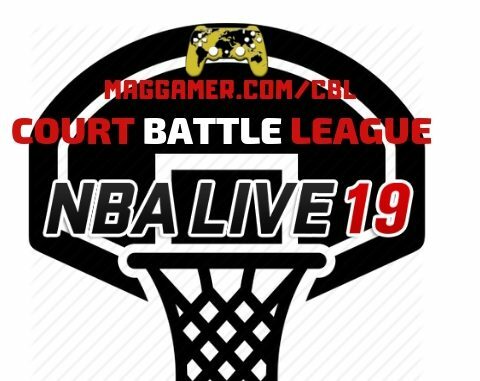 Looking for real competitions and to build a community. Find me on all platforms as @MagGamerInc Catch you in the Apex arena.